Do video games affect college students’ capability for suicide? Do video games affect college students' capability for suicide? New Rochelle, NY, January 11, 2016–Suicide is the second leading cause of death among college students in the U.S., and a new study suggests that students who play many hours of action video games in particular may be more capable of acting on suicidal thoughts. The study linking action video games, which usually involve violence and aggressive content, to acquired capability for suicide is published in Cyberpsychology, Behavior, and Social Networking, a peer-reviewed journal from Mary Ann Liebert, Inc., publishers. 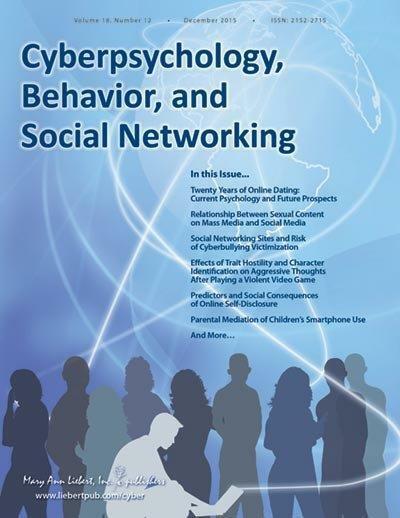 The article is available free to download on the Cyberpsychology, Behavior, and Social Networking website until February 11, 2016. In "The Relationship Between Video Game Play and the Acquired Capability for Suicide: An Examination of Differences by Category of Video Game and Gender," Sean Mitchell, Danielle Jahn, Evan Guidry, and Kelly Cukrowicz, Texas Tech University, Lubbock, found no significant association between overall hours of video game play and acquired capability for suicide (ACS), and gender did not make a difference. However, when focusing on the action category of video games, the relationship between hours of game play and ACS became significant. "When conducting suicide risk assessments, it is imperative that clinicians assess not only frequency of game usage, but also category of games most frequently played," says Editor-in-Chief Brenda K. Wiederhold, PhD, MBA, BCB, BCN, Interactive Media Institute, San Diego, California and Virtual Reality Medical Institute, Brussels, Belgium. "This may assist in improved detection of students at increased risk for lethal self-injury." Mary Ann Liebert, Inc., publishers is a privately held, fully integrated media company known for establishing authoritative peer-reviewed journals in many promising areas of science and biomedical research, including Games for Health Journal, Telemedicine and e-Health, and Journal of Child and Adolescent Psychopharmacology. Its biotechnology trade magazine, Genetic Engineering & Biotechnology News (GEN), was the first in its field and is today the industry's most widely read publication worldwide. A complete list of the firm's 80 journals, books, and newsmagazines is available on the Mary Ann Liebert, Inc., publishers website.